The results of the 2019 Sellers Choice Awards are in, and online sellers had a lot to say about the platforms on which they sell. Sellers are judged by buyers and marketplaces every day, with every transaction. The annual Sellers Choice Awards give sellers the opportunity to rate the marketplaces for a change! The nominations process was open to selling venues of all kinds: online marketplaces, classifieds, social networking platforms, and mobile apps - and then there were the hybrids. Some were general selling platforms while others had a specialty, such as handmade or fashion. A main objective of Sellers Choice is to identify what sellers say is working well and what challenges they face on each venue. Clearly volume of sales is important, but keep in mind that sellers may use certain venues for supplementing sales or for selling items they can't sell elsewhere. Some sellers who use smaller venues say they are willing to put the work in to drive their own traffic to their listings. How sellers rated the marketplaces speaks volumes about what's important to them. This year, two mobile apps cracked the top-five, while only one social networking platform made it through the nominations process - and it came in 11th place this year. We have more to say about social and mobile trends in the main overview article. 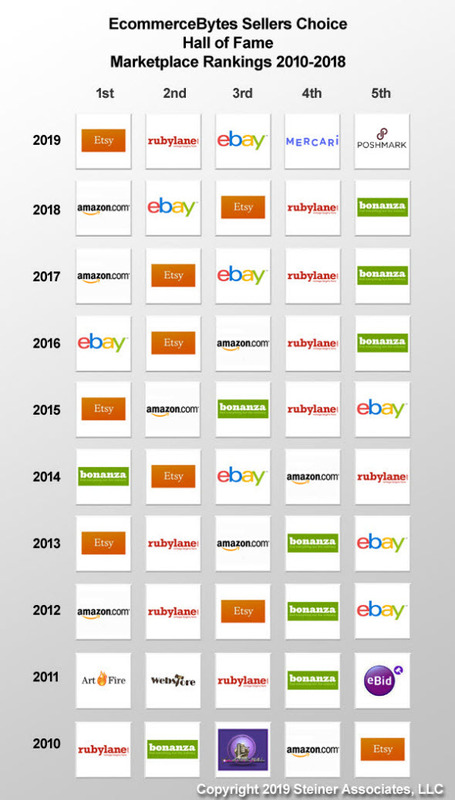 The following table shows the top 5 marketplaces for each year of the Sellers Choice Awards (2010 - 2019). We found this year's seller feedback particularly fascinating, and you can learn something from reading seller comments even (or perhaps especially) on marketplaces where you don't currently sell. Good traffic; tools and support for sellers; and the quality of buyers give marketplaces an edge as far as sellers are concerned. And you probably won't be surprised at what sellers say need improving! 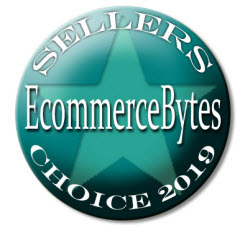 An introduction to the Sellers Choice survey along with a summary of the overall ratings can be found on the EcommerceBytes website, along with links to results for each of the 11 online marketplaces included in the survey. Thanks to readers for participating in the 10th annual Sellers Choice Awards! I noticed Mercari made the top 5 list. I'm with Mercari and there are several things EB can learn from them, esp. the seller & buyer ratings. The same with Posh. They have a very forgiving return policy. And the nonsense that EB piles on with the penalties if you fall below standard and fees for Buy It now listings. I can't wait for my store subscription to end this May. From the results I would say not too many men took the survey! I consider 3 of those 5 sites to be "girlie" sites. . . . .
@toolguy - I'm sure many men responded to the survey. And I'm sure there are many men selling on the sites you believe are only populated by women. You do realize that most of the major fashion designers are men, right? And if someone can make a profit selling fashion items, be it man or woman, what's the difference? Not every man has a desire to sell used aircraft tools. Mercari is attrocious in my opinion and when it comes to customer service for sellers, and they do whatever they want with your money even refund willy nilly worse than ebay and amazon. I feel its popular because its very kid friendly, seeing as a lot of the buyers are kids. You will also be banned eventually for nothing, just how they work. How many UK readers voted for Mercari ? "I consider 3 of those 5 sites to be "girlie" sites. . . . ."
Seriously? What does that mean, outside of being incredibly sexist. That sounds like something the Beaver would have said to Gilbert in 1963. Geesh! Get to work on your taxes Tool. The tax man cometh for you.